Here are my flash cards for 2.1.d Implement and troubleshoot Trunking. I am giving these flash cards in TXT and in an ANKI package. Regarding VTP, what is true about the domain name in V1-2 and V3? Switches automatically learn the domain name as long as they have an active trunk formed between them (static or DTP). In V3 it must be statically set on all switches. What types of ports does VTP require its messages to go across? What is true about the VTP password for all switches in 1 VTP domain? What show command will display version, domain, operating status and other VTP info? What other L2 Encapsulation does VTP support besides ethernet? Regarding normal, reserved, and extended VLANs, what did VTPv3 introduce? VTPv3 introduced support for the extended vlan range. Which versions of VTP support private VLANs? Which versions of VTP allow us to turn it off PER PORT? How about turning it back on? Do it for port g0/1. What is true about the VTP password and protecting it in all versions of VTP? The VTP password will not show up in the running config. How do we show the VTP password? What hashing algorithm is used to send the VTP password? In VTP v1 and 2 can we have multiple VTP servers? Yes we can have multiple VTP servers by default switches are VTP servers but they can be changed to client. What special command must be run on the server to become the master for VTP v3, in exec or global config? With VTP v3, what 3 other features do we have available for the password? Give examples.. The above requires you enter the VTP password as an MD5 hash, and display as it as a hash. Are VTP messages encapsulated as 802.3 Ethernet or Ethernet II? “Configure the 3 switches in the VTP domain of “test” with a password of “mypassword”, use VTP version 3, with a primary server of SW2. 3. Make SW1 a VTP client, SW2 and 3 servers. What is the VTP MD5 digest for? The VTP MD5 digest is a digest of the password and of the VTP config. What is the VTP configuration revision? What issues can arise when the client revision is higher than the server when joining a VTP domain? How do you fix it? The VTP configuration revision number is the number of times VTP has changed its config. If the client’s revision number exceeds the server it will not properly join the domain. The only fix for this is to raise the revision on the server by changing the config. If a server joins the domain with a higher revision then he will wipe out the vlan database. What are the 4 VTP modes possible? In VTPv3, how do you configure a switch as secondary? What is its purpose? In VTP, what command will show all VTP devices participating in the database? 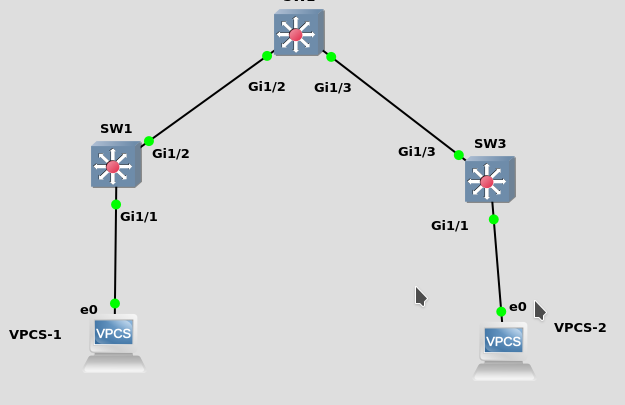 Finally configure MST propagation via VTP from SW2, show how to verify it, then set SW1 and 3 to use MST. Use “show vtp status” to verify it, look at the MST portion. “show spanning-tree mst configuration” and verify the clients got the MST config from the primary server. How do devices running in VTP transparent mode operate? Devices configured as “vtp mode transparent” do not process VTP updates or use them, however they pass them along the L2 path to other devices. In the following topology, configure SW1 (server) and SW3 (client) in a VTP domain of test, with a password of mypassword, with VTP version 2. Configure SW2 such that it only passes these messages and does not participate in VTP. How do we enable VTP pruning? How do we verify it? What is its behavior in V1-2 vs V3? In V1-2, VTP pruning can only be enabled on the VTP server(s), then it propagates down. In V1-2 the above is true, however in V3 we must explicitly configure all switches with “vtp pruning”. The first part is pruned, the second part is allowed. 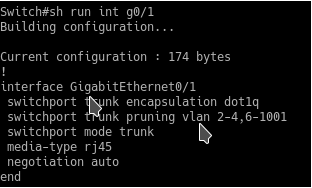 Are any extra trunk configurations required for VTP pruning or will it just work as long as VTP messages can pass? How do we prevent vlan 5 from being pruned for the Trunk int g0/1? How do we verify it? How does VTP accomplish it? This command removes vlan 5 from being prune eligible, meaning VTP will always send a join for this vlan even if it does not have to. In VTP, what is a advertisement request message for ? In VTP, what is a summary advertisement? This advertisement happens every 5 minutes, every switch sends out their VTP domain with revision number, this message contains no VLAN info. In VTP, what is a subset advertisement? This advertisement contains all of the VLAN info for other switches. In VTP, what is a join ? This message is utilized if we have VTP pruning enabled, the join message is used to tell upstream switches to allow the joined vlan on their trunk. These go out every 6 minutes. What is true about VTP pruning and the extended vlan range? Is VTP pruning enabled by default? What command allows us to add vlan 5 to the trunk g0/1? What command allows us to delete vlan 10 from the trunk g0/1? By default which vlans are allowed on a trunk? What command will verify which vlans are manually pruned from a trunk? What global config command will tag the native vlan on all trunks? 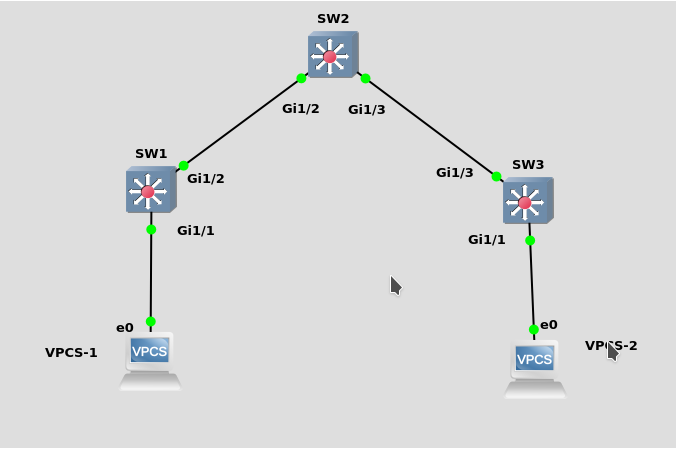 What two features detect native VLAN mismatches? What command allows us to change the vlan encapsulation to ISL, how about 802.1q? When in VTP mode client what will happen if you create a vlan by configuring the port in that vlan? If you create a vlan via assigning a port to it, the switch will accept the commands with no warning, however it will NOT actually work because of being in VTP mode client. This is different from when you create a vlan in global config where it will warn you that you cannot do that. What command will display general info about DTP and the DTP timers? How can we change the native vlan on the trunk (int g0/1) to vlan 2?